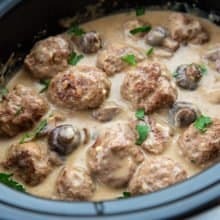 This is the perfect crock pot meatballs recipe, homemade meatballs in a creamy mushroom gravy that cooks all day long. Perfection! Combine together the meatball ingredients in a large bowl. Form the meat into 24 large meatballs. Get out a large skillet and place the meatballs into it. Over medium high heat, fry the meatballs until they are golden brown on all sides. The more browned they are, the more flavour you will get! Drain the grease well and place the meatballs into the bottom of a large Crock Pot. In a large skillet, fry the mushrooms and onion in the butter until the onions are soft and the mushrooms have reduced in size and released most of their moisture. Add in the garlic and fry for 1-2 minutes until browned and fragrant. Pour in the beef stock and Worcestershire sauce. Stir and scrape any browned bits off of the bottom of the pan for extra flavour. Pour the sauce over the meatballs in the crock pot. Cook on high for 4 hours, or 6-8 hours on low. When you are ready to serve, remove the meatballs and place into a large serving bowl. Cover to keep warm. Whisk together the whipping cream and the cornstarch, then whisk into the still hot mushroom sauce in the crock pot. Whisk until the sauce thickens, 2-3 minutes. Serve the meatballs with the mushroom gravy poured over top. We like to make mashed potatoes for serving with these. This recipe is large but you can easily cut it in half if you want! I like to have leftovers, so I make a large amount of meatballs. You can choose to make half this recipe if desired. All calories and info are based on a third party calculator and are an estimate. Actual nutritional info will vary with brands used, your measuring methods etc.